Standard and Poor’s reported that house prices rose in June. According to the most recent release, the S&P/Case-Shiller House Price Index – National Index grew by 7.1% on a not seasonally adjusted basis in the second quarter and 10.1% over the previous four quarters. The House Price Index – 20 City Composite grew by 12.1% over the past year as all 20 cities posted annual gains. Year-over-year house price growth was strongest in Las Vegas, 24.9%, San Francisco, 24.5%, Los Angeles, 19.9%, and Phoenix, 19.8%. Meanwhile, house prices in New York rose by 3.3%. Standard & Poor’s calculates tiered house price indexes for 17 cities included in its House Price Index – 20 City Composite. Tiered house price indexes for Cleveland were not available in March 2013. Tiered indexes measure changes in the value of existing single-family houses in three price tiers – low, middle, and high. Each tier represents approximately one-third of the sales transactions in each respective market. An earlier post illustrated that house prices in the low tier experienced the largest decline following the housing boom, but are currently recording the strongest post-trough increases. However, an alternative method for evaluating the housing market recovery is to examine current prices relative to their peaks. Geographically, this analysis demonstrated that house prices in Dallas and Denver have surpassed their boom peak levels while house prices in cities such as Phoenix and Las Vegas, which have climbed the most from their low, are still well below the peak levels reached during the boom period. This analysis can also be performed across house price tiers with similar results. Although low tier house prices have climbed highest from their trough, high tier house prices tend to be closest to their boom-time peaks. 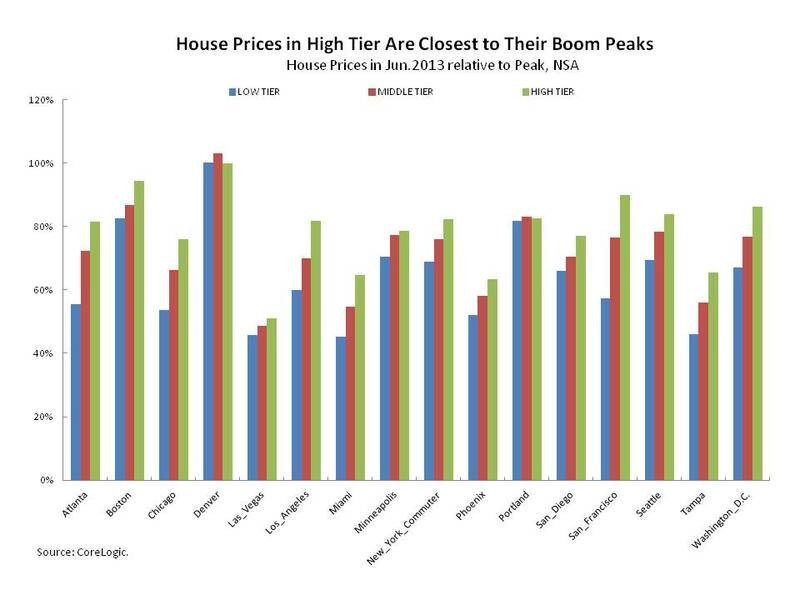 The chart below shows that in every city except for Denver and Portland, high tier house prices are closest to their boom-peaks. In Denver and Portland, the distance between current prices and boom peak prices is roughly the same across all three price tiers, while, in Denver specifically, the low and medium tier house prices have surpassed the highest level reached during the housing boom and house prices in the high tier are 98% of their boom peak level. The gyration in house prices across house price tiers largely reflects the implications of life cycle dynamics for the housing market. Higher priced homes tend to be inhabited by older, more financially-established households with higher levels of housing equity. In contrast, lower priced homes tend to be purchased by younger households with less housing equity. As a result, significant house price declines like those experienced during the recent housing bust will completely erode equity, invite foreclosure, amplify downward pressure on prices and thus have a larger impact on house prices in the lowest tier. However, going forward, house prices in the low-tier should continue to rise as many of these households return to the housing market. For full histories of the composites and 20 markets included in the S&P/Case-Shiller composites, click here cs. This entry was posted on Tuesday, August 27th, 2013 at 4:19 pm and is filed under By the Numbers, Data. You can follow any responses to this entry through the RSS 2.0 feed. You can leave a response, or trackback from your own site.